Relive the entire magical day here. 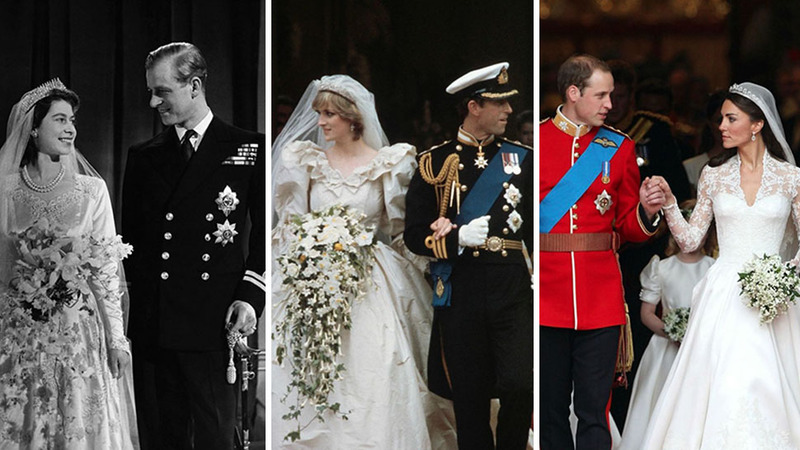 Long before Prince Harry and Meghan Markle made headlines for their wedding, PDA, and general sweetness as a couple, there was a young Prince William and his longtime girlfriend, Kate Middleton. 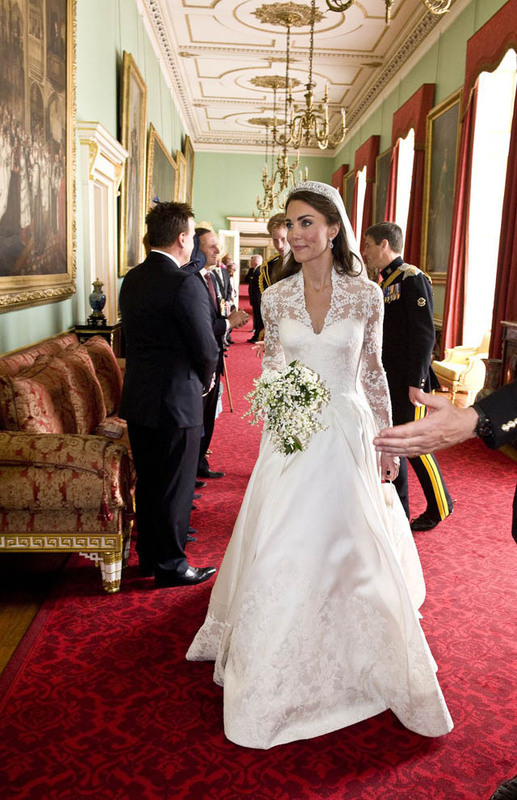 Now, the royal parents of three are better known as the Duke and Duchess of Cambridge, but prior to April 29, 2011, they were just an ordinary pair of college sweethearts... planning the royal wedding of the century. 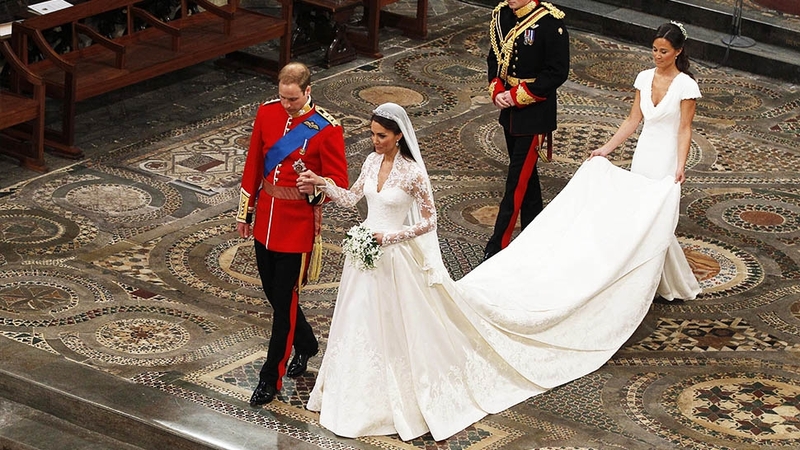 In honor of their seventh wedding anniversary and Harry and Meghan's upcoming nuptials, let's take a look back at every memorable moment of Will and Kate's iconic big day. 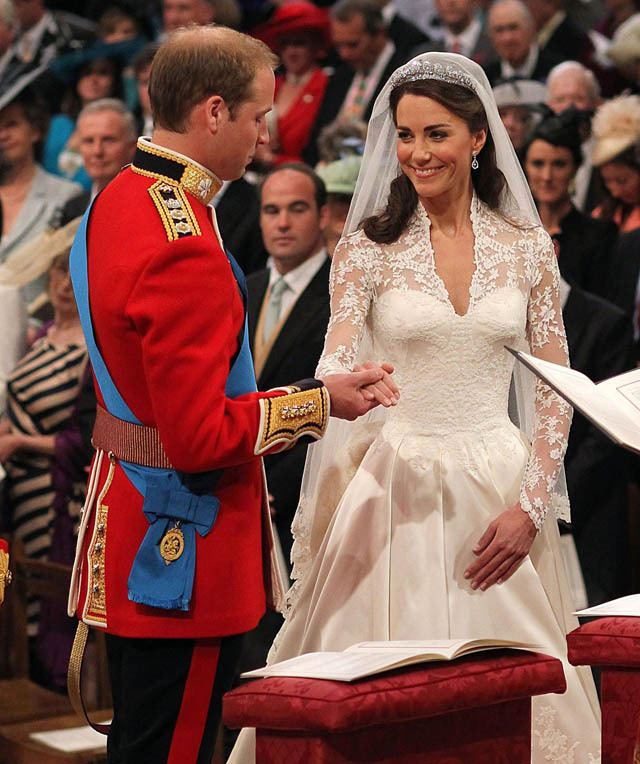 The ceremony for Will and Kate's wedding started at 11 a.m. on Friday, April 29, 2011. Before the wedding began, Westminster Abbey was decorated with six English Field Maple trees and two Hornbeam trees, all of which were 20 feet high. 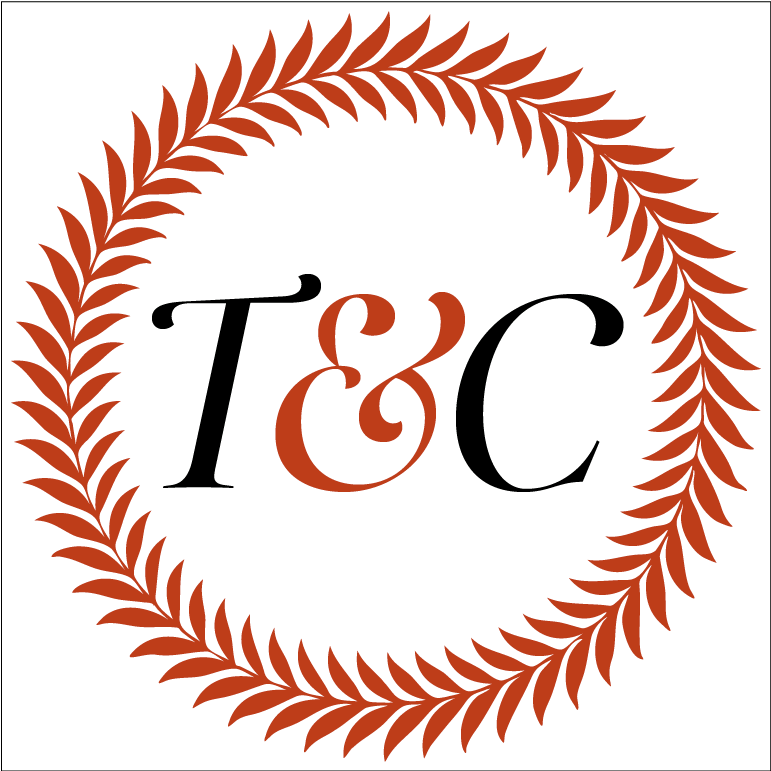 London-based floral designer Shane Connolly and his team handled the floral design at the Abbey and at Buckingham Palace. 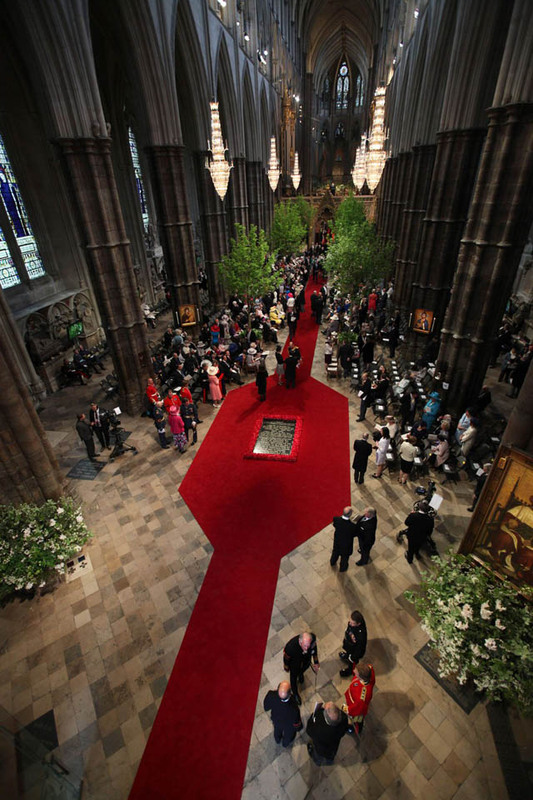 Before the bride and groom made their appearance, nearly 2,000 guests arrived to watch the ceremony at Westminster Abbey. The guest list included various foreign royals, politicians, and diplomats from across the Commonwealth, and members of the British armed forces. 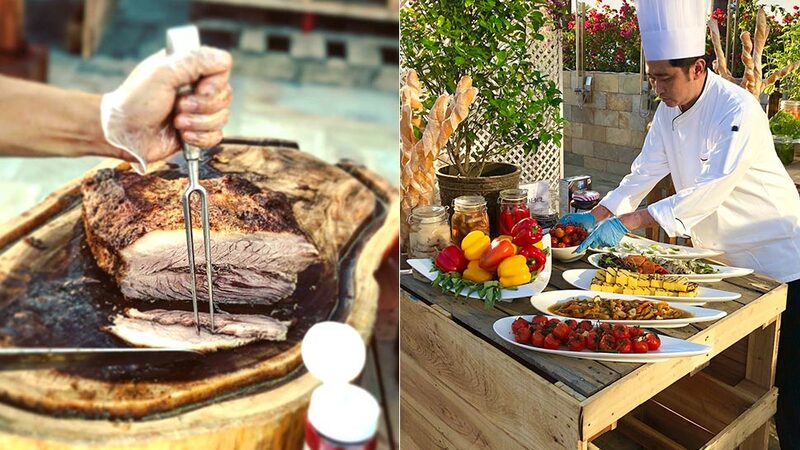 And, given that this was indeed a royal wedding, some of our favorite British celebrities were invited, like Elton John and Victoria and David Beckham. 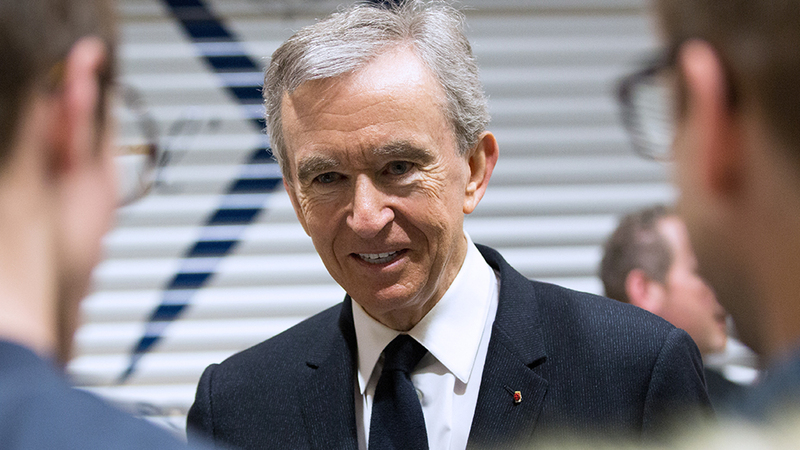 Guests were instructed to arrive as early as 8:15 a.m. for the 11 a.m. ceremony start time. 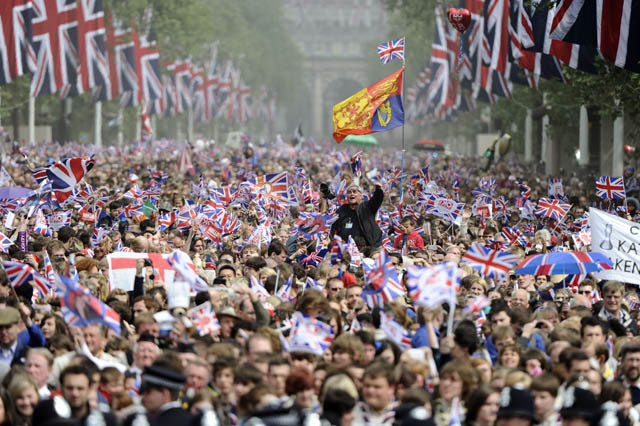 London's Metropolitan Police estimated that one million people lined the streets to see the royal wedding parade, according to the BBC. 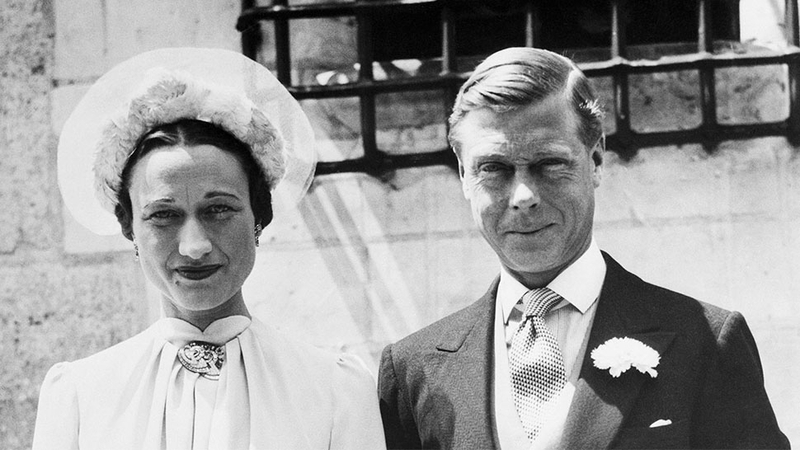 April 29 was an official public holiday, so the wedding could be properly celebrated across the U.K. The groom rode to the Abbey with his best man, Prince Harry. Will and Harry left Clarence House, the official residence of Prince Charles, at 10:10 am in a Bentley State Limousine. 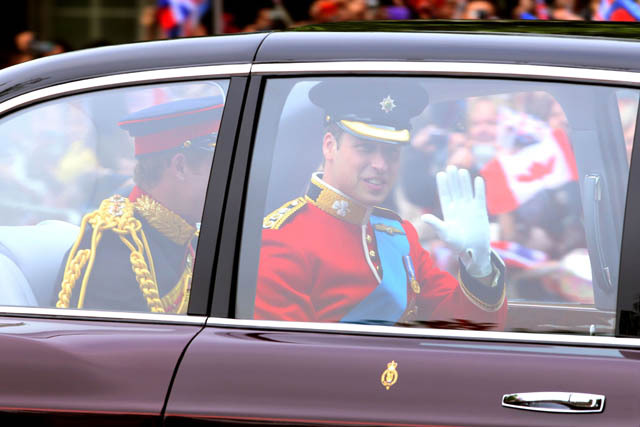 The duo rode through London passing thousands of royal fans on their way. 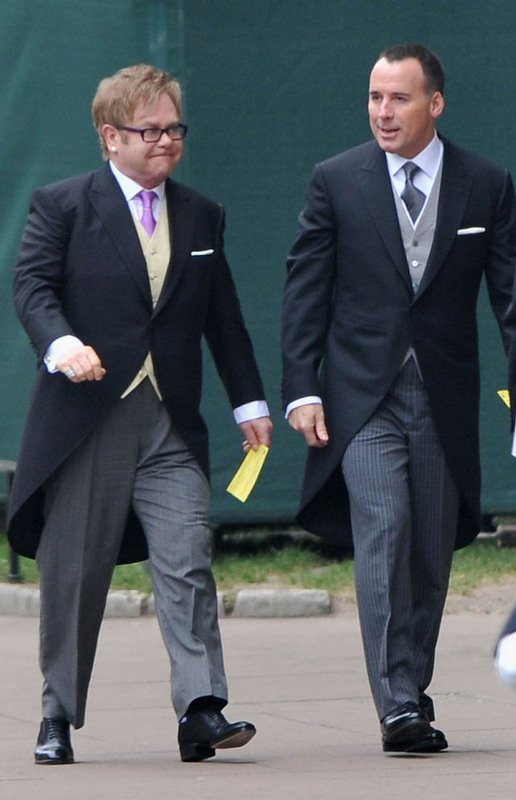 After a short ride from Clarence House, Will and Harry arrive at the Abbey, fans get a full look at Will's wedding day ensemble. The Prince wore the Colonel of the Irish Guards uniform, while Harry chose the uniform of a Captain of the Household Cavalry. The mother of the bride, Carole Middleton, and brother of the bride, James, arrive at Westminster Abbey just after William and Harry. The Middleton's spent the night before the wedding at the Goring Hotel in London. Princess Eugenie and Princess Beatrice arrived at the Abbey with their father, Prince Andrew. Other members of the British royal family quickly followed, including Princess Anne, Prince Edward, and Sophie, Countess of Wessex. 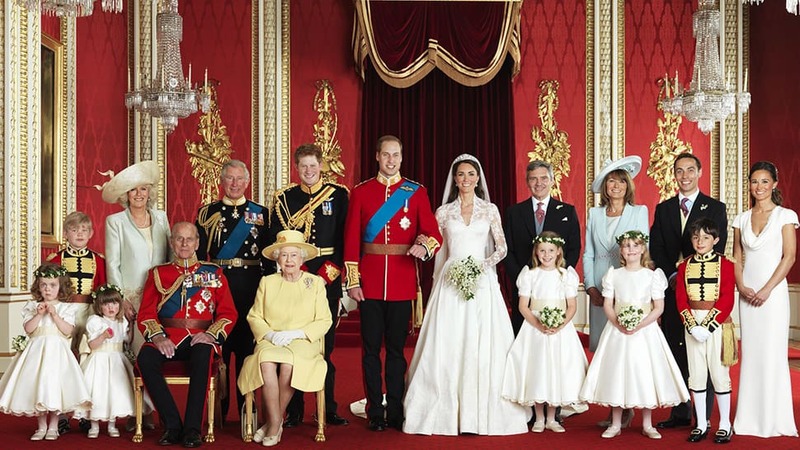 The father and step-mother of the groom were the last to arrive before the Queen, Prince Philip, and the bridal party. 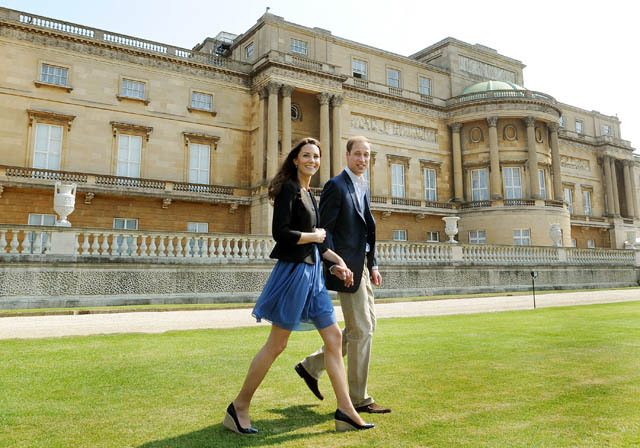 The couple were with William and Harry at Clarence House before the wedding. The monarch was at Buckingham Palace prior to the wedding. 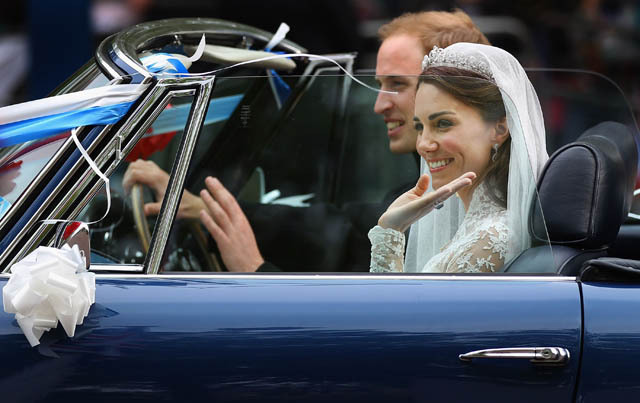 She rode to the wedding through the procession route, waving at thousands of fans on the way. Kate leaves the Goring Hotel with her dad, Michael Middleton, by her side. The bridal party, including Pippa Middleton, two page boys, and four bridesmaids, leave a few minutes before. The ride from the Goring to the Abbey takes less than 10 minutes. 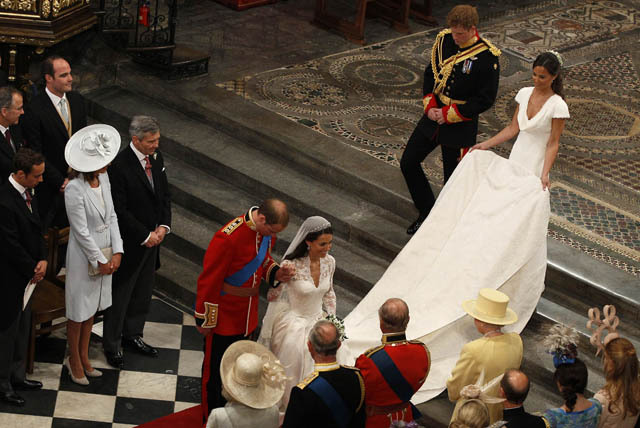 The bridal party is led by Kate's maid of honor, Pippa, at the Abbey. Pippa's gown is by Sarah Burton at Alexander McQueen, and the bridesmaids wore dresses by Nicki Macfarlane. 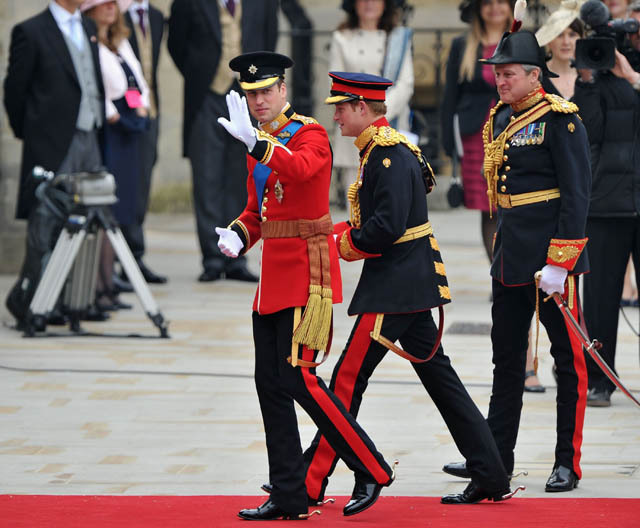 The page boys wore a uniform based on a Foot Guards officer uniform, in a red fabric that matched Prince William's ensemble. 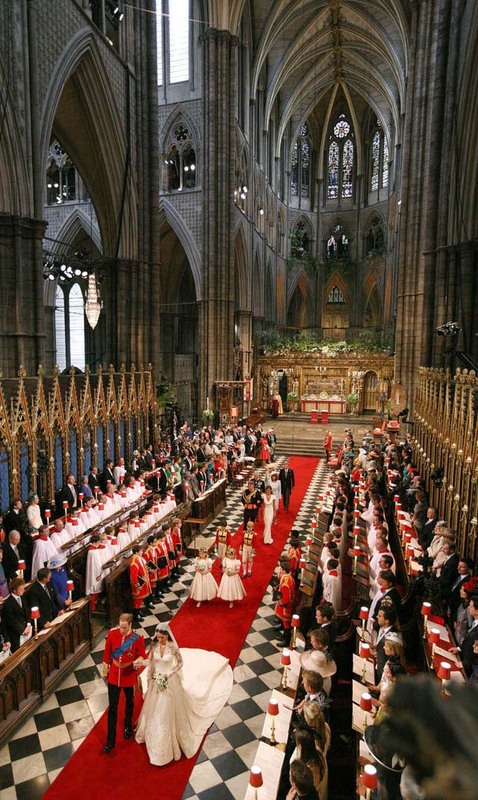 Michael Middleton walks his daughter down the aisle of Westminster Abbey with the bridal party following behind. 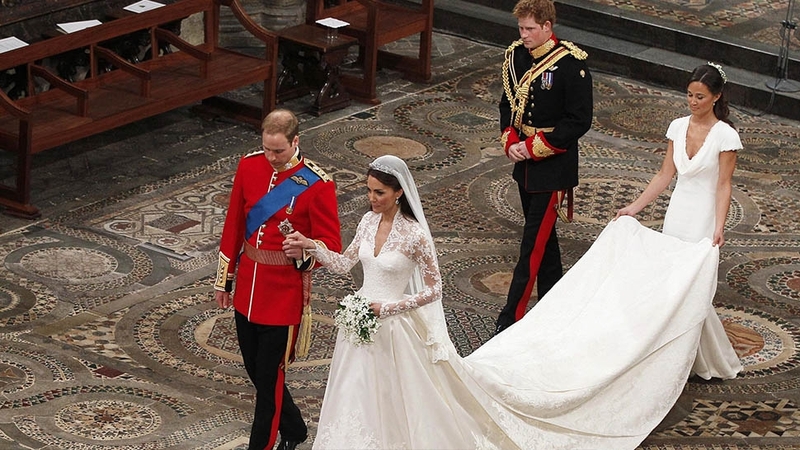 William was at the front of the Abbey with his back turned to the aisle, so he didn't get a glimpse of Kate until she met him at the altar. 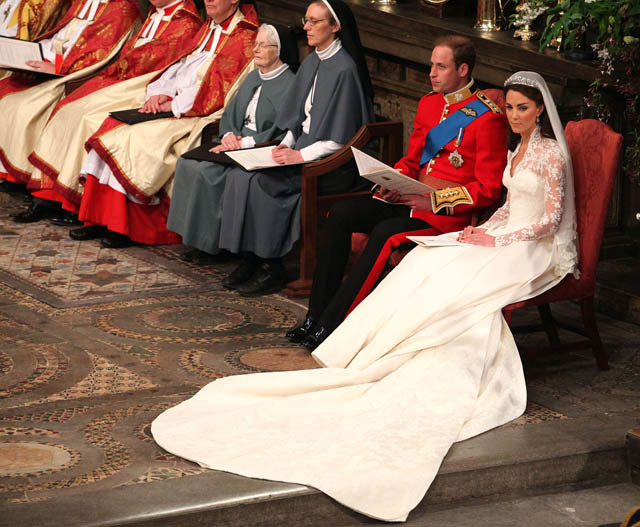 The royal family was seated to the right of the couple, and the Queen's seat was the closest to the altar. 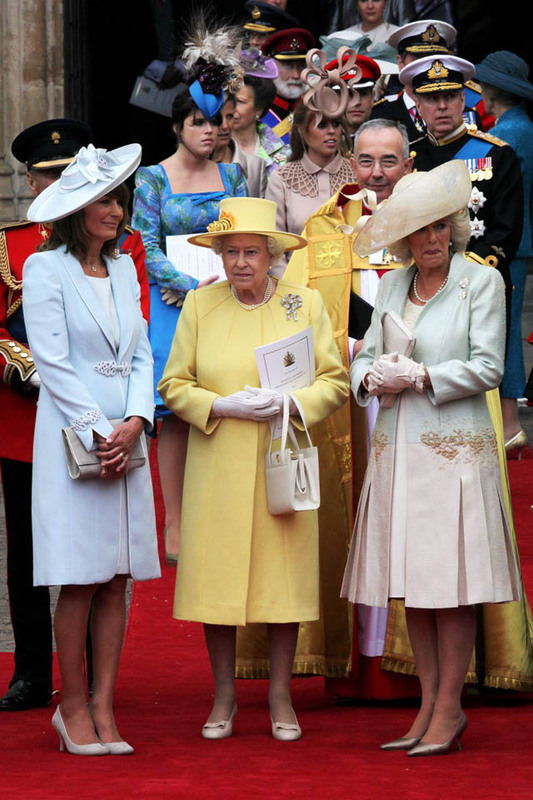 The Middleton family sat on the left side. 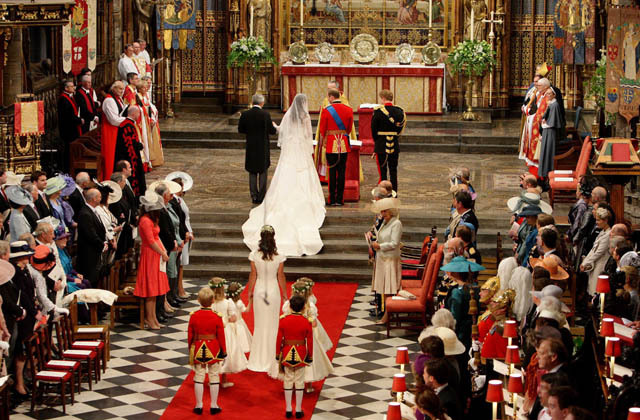 After a three-minute walk with her father, Kate finally sees her groom at the altar in Westminster Abbey. Kate's bouquet contained lily of the valley, hyacinths, a sprig of myrtle, and Sweet William. 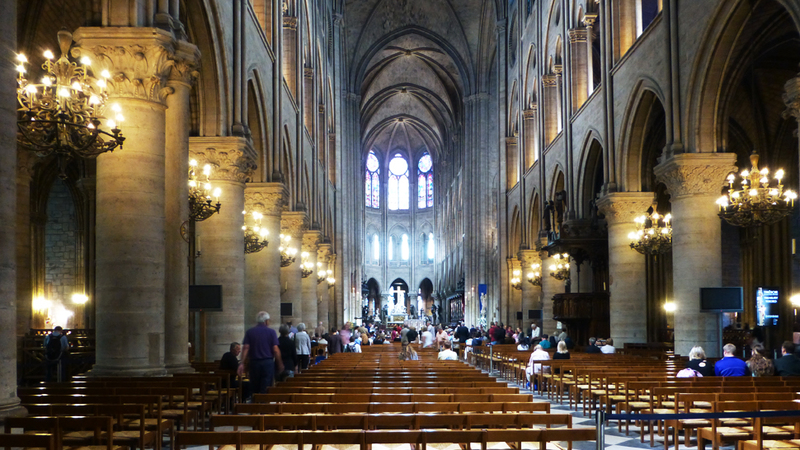 The ceremony, which was led by the Archbishop of Canterbury, was over an hour long. 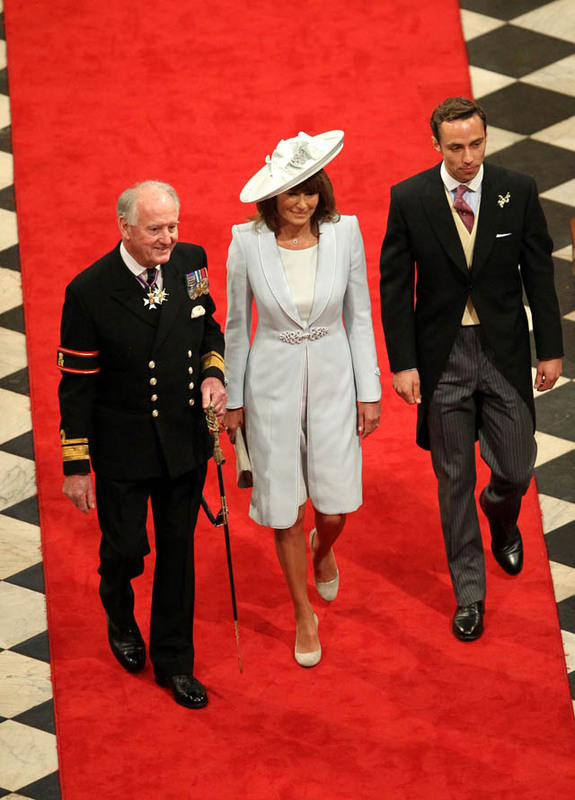 The couple sat for part of it, like when James Middleton did a reading. 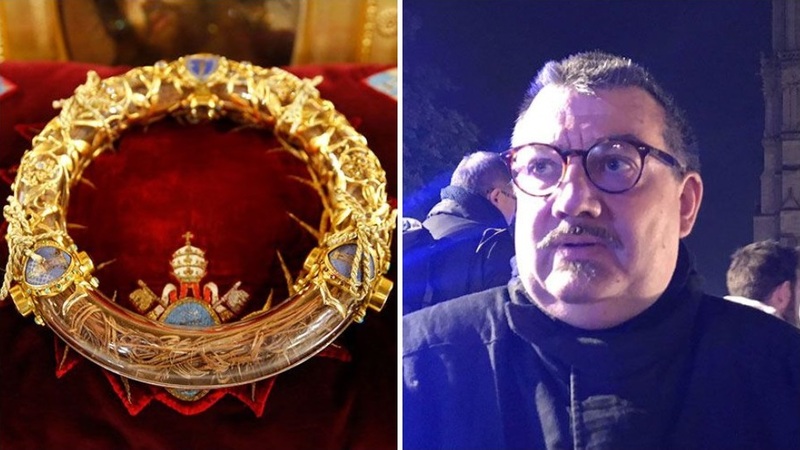 The couple exchanged vows, but not rings: William opted not to receive a wedding ring out of personal preference. Kate's wedding ring is made of gold that was mined in Wales. 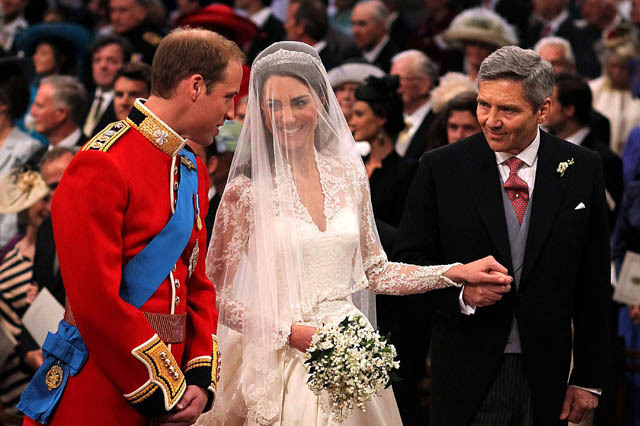 Like Diana, Kate dropped the promise to "obey" her husband from her vows. Officially husband and wife, the Duke and Duchess of Cambridge greet the Queen before processing out of Westminster Abbey. 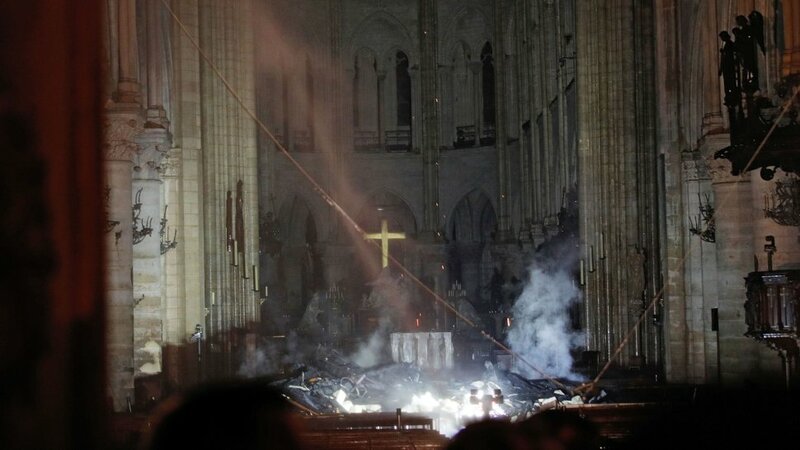 Will bowed to his grandmother, while Kate curtsied. 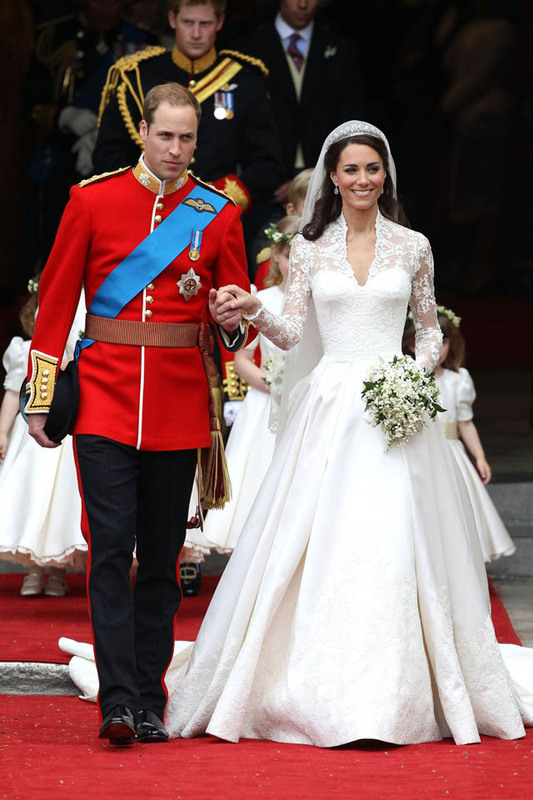 After the ceremony ended, Will and Kate led a procession out of the Abbey. 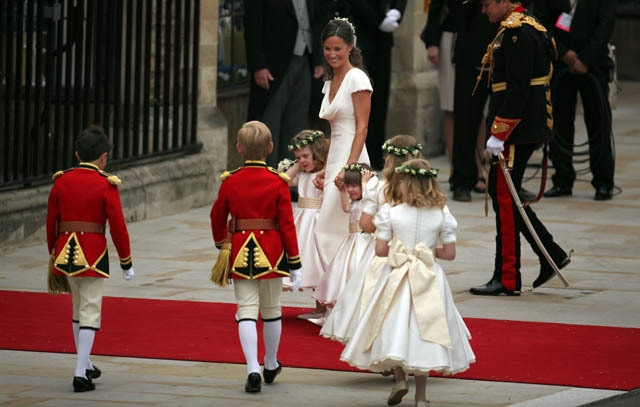 The newlyweds were followed by their bridesmaids, page boys, Pippa and Harry, and their parents. 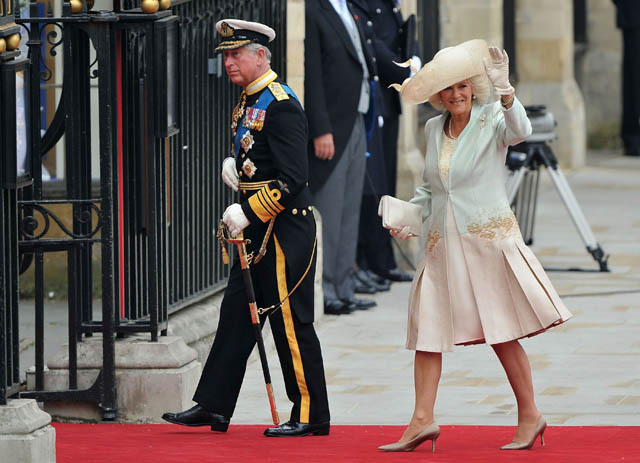 Carole Middleton walked next to Prince Charles, while Camilla, Duchess of Cornwall exited with Michael Middleton. 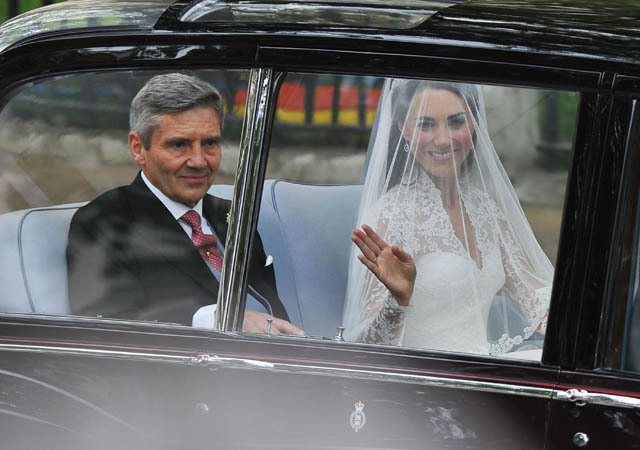 The newlyweds were beaming as they emerged from Westminster Abbey as husband and wife. 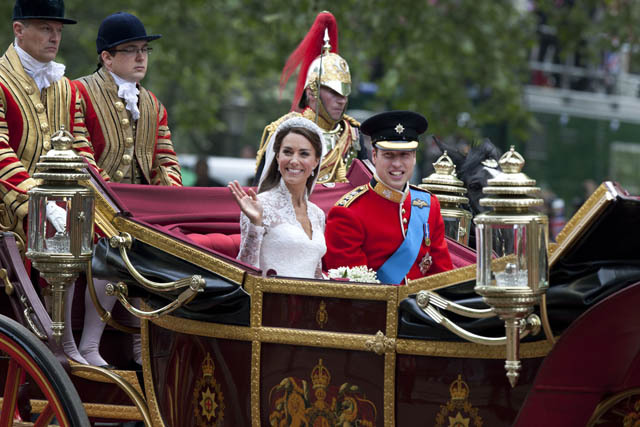 After the ceremony, Will and Kate took a carriage from the Abbey to Buckingham Palace, where they greeted royal fans who were waiting along the route. Harry and Meghan will have a similar procession in Windsor after their ceremony. 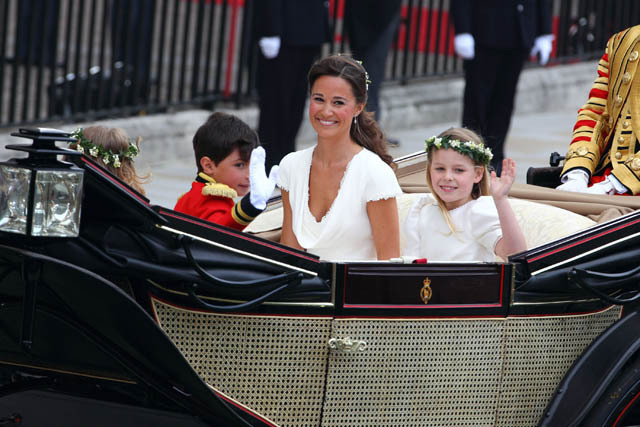 Pippa Middleton shared a carriage with two bridesmaids and a page boy during the procession parade. The Queen, Carole, and Camilla all headed back to Buckingham Palace for the reception in carriages, following Will and Kate in the celebratory parade. Will helps his new wife out of the carriage at Buckingham Palace after their procession through London. 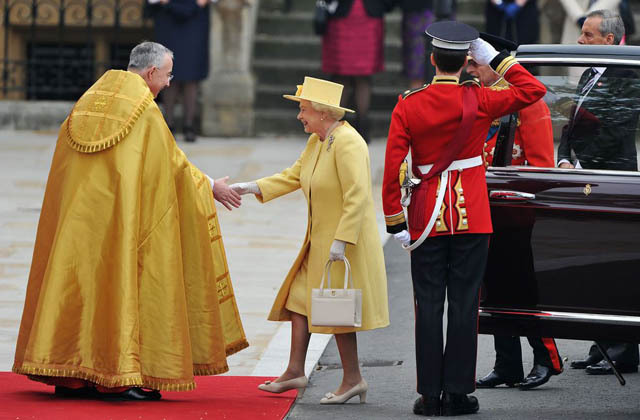 Around 650 guests attended the lunchtime luncheon at the Palace, which was hosted by the Queen. 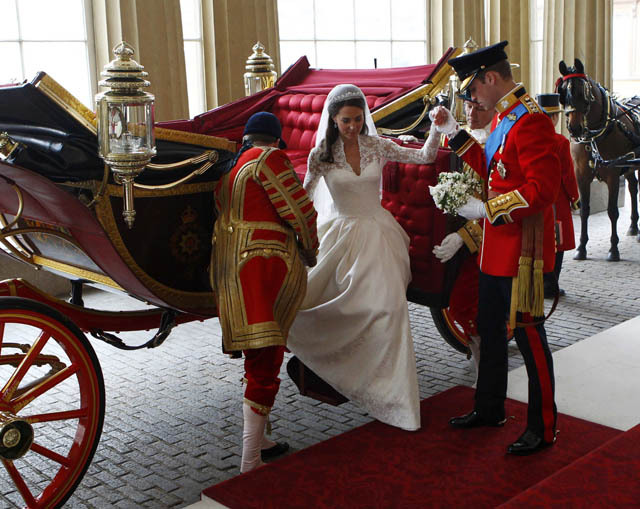 The couple's arrival was closely followed by the rest of the bridal party, who rode to the Palace in two separate carriages. 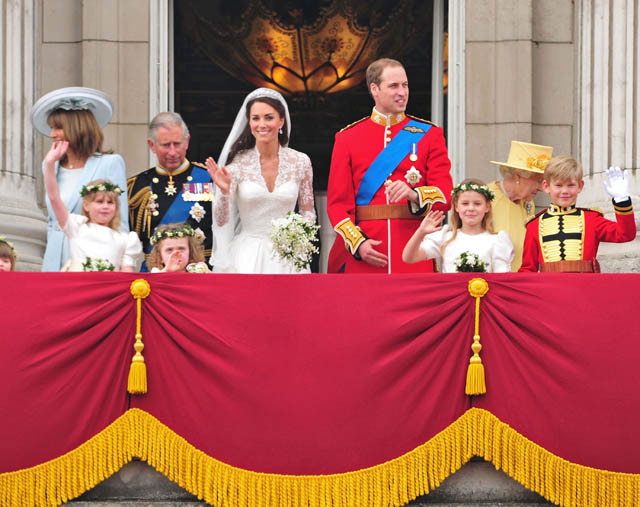 The bride, groom, wedding party, and family members head to the Buckingham Palace Balcony to greet thousands of well-wishers outside. The happy couple actually kissed twice on the Palace balcony during this now-iconic moment. Above, there's a celebratory flypast by the Royal Air Force. 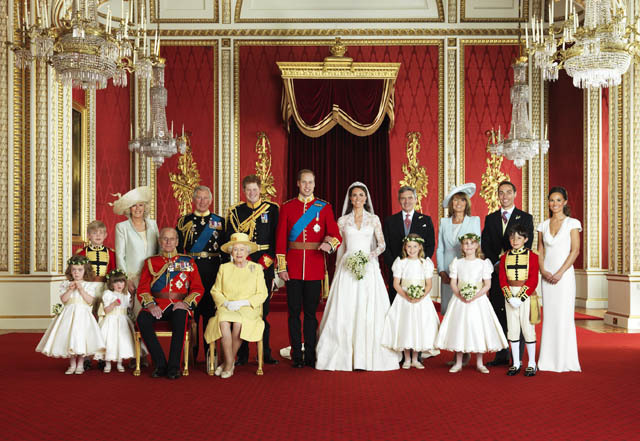 Before the reception began, the entire bridal party along with members of the royal and Middleton families pose for official portraits in the Throne Room at Buckingham Palace. The lunchtime reception officially begins after their balcony moment and portrait session. 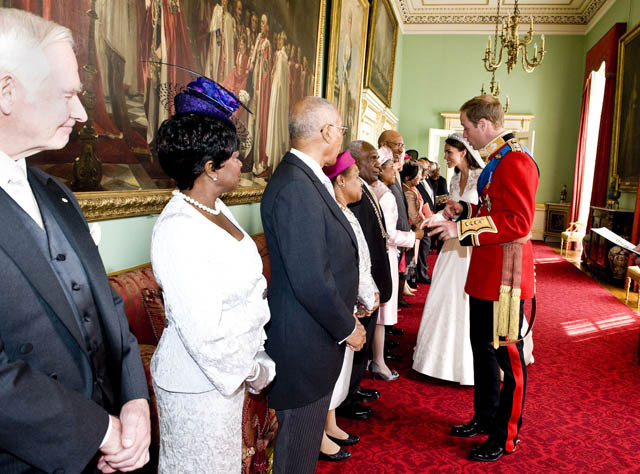 In this receiving line, Will and Kate greeted Prime Ministers and politicians from across the Commonwealth. Kate was still holding her bouquet at the Buckingham Palace reception. 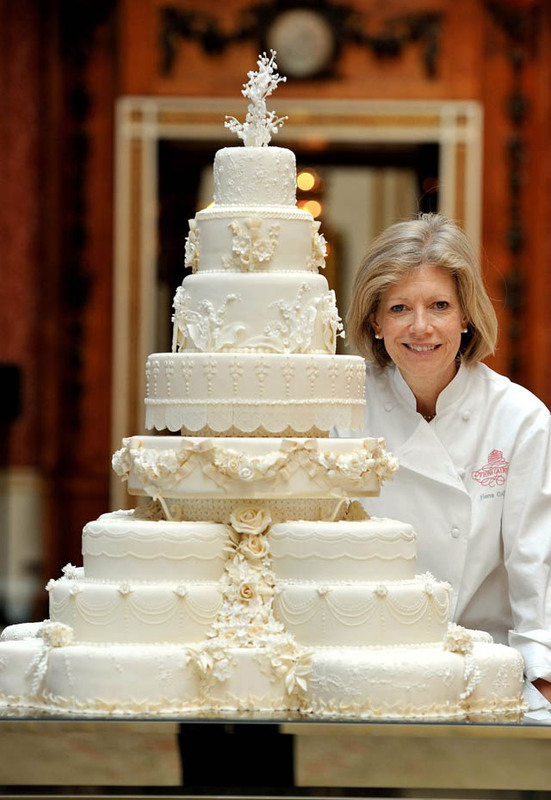 Fiona Cairns created the eight-tier fruitcake for the royal wedding. Fruitcake is the traditional English wedding cake, but Harry and Meghan have picked a lemon elderflower cake for their wedding day. 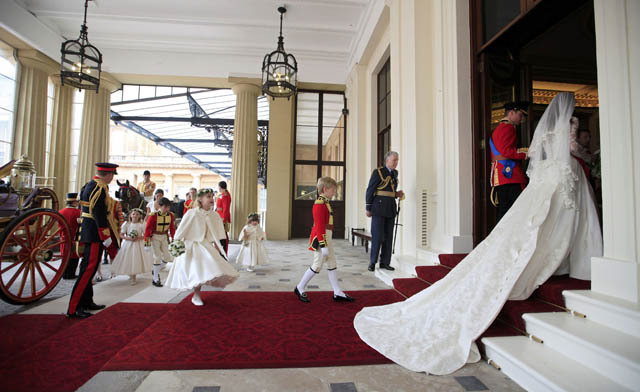 After the lunchtime reception at Buckingham Palace, the newlyweds were off to Clarence House to change for another evening reception held for a smaller number of guests. William drove his new wife to Clarence House in an Aston Martin DB6 that belongs to Prince Charles. 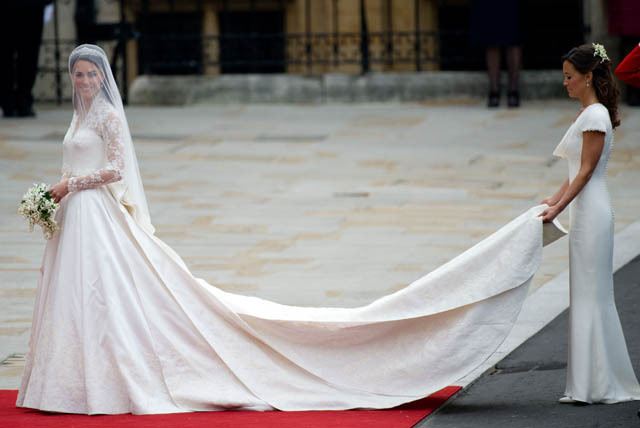 The Duchess of Cambridge changed into a second wedding dress, also by Sarah Burton for Alexander McQueen, for the evening wedding reception. She's photographed here leaving Clarence House for Buckingham Palace. 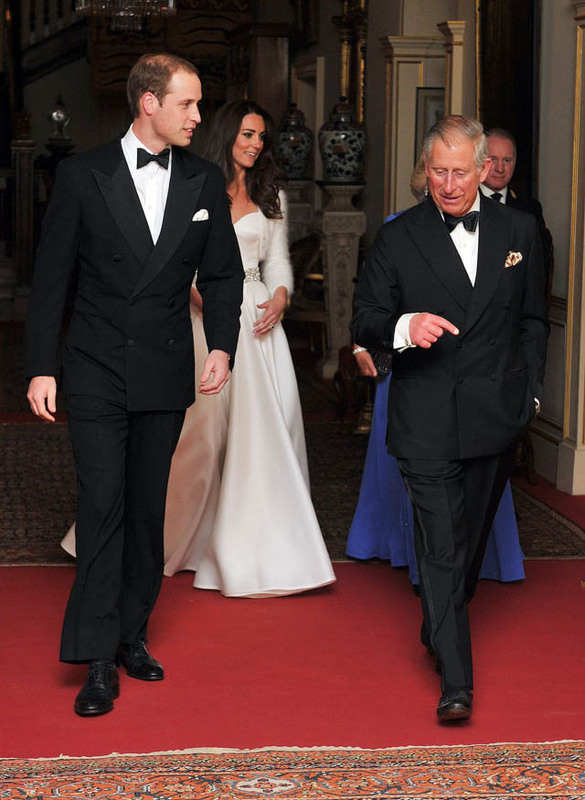 Like his bride, William changed into a tuxedo for their evening wedding reception. 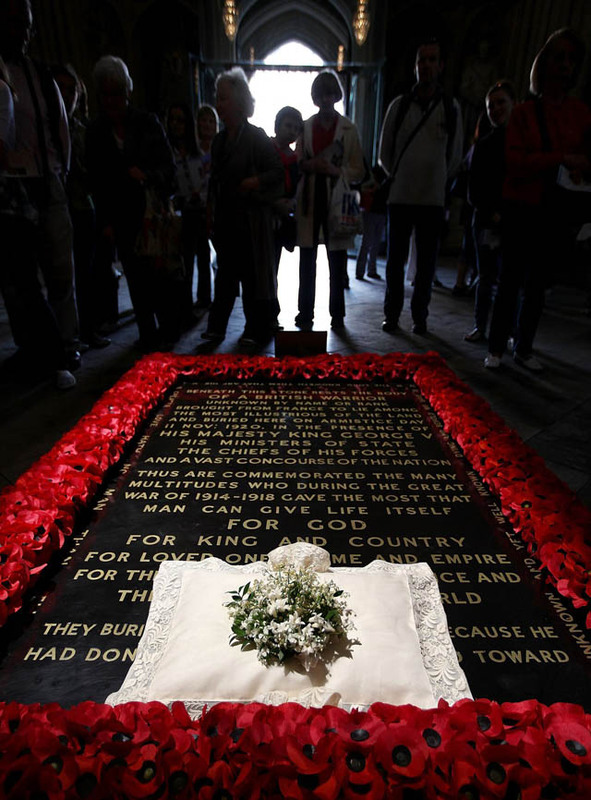 Per royal tradition, Kate's bouquet was left at the Tomb of the Unknown Warrior in Westminster Abbey the day after the wedding. On April 30, 2011, the newlyweds left Buckingham Palace via helicopter to head for their honeymoon, which took place on a private island in Seychelles. 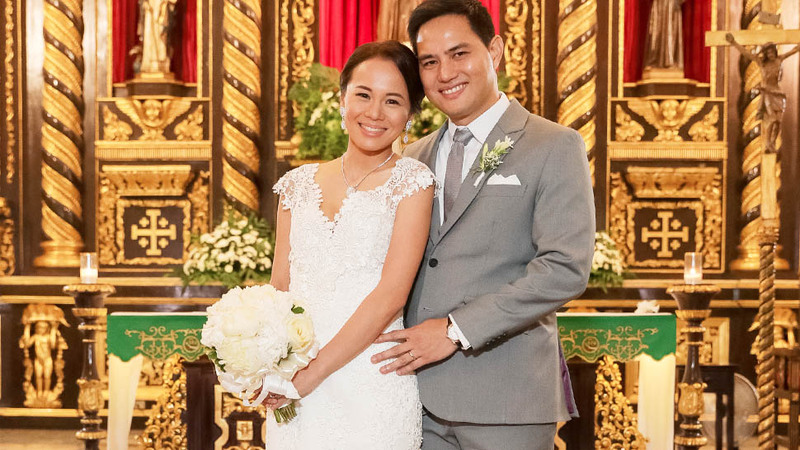 WANT TO RE-WATCH THE ENTIRE WEDDING?